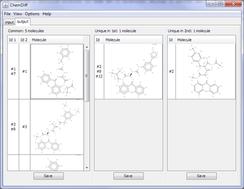 ChemDiff is an Indigo-based utility for finding duplications and visual comparison of two files containing multiple structures. SDF, SMILES, CML, MOLFILE input formats are supported. 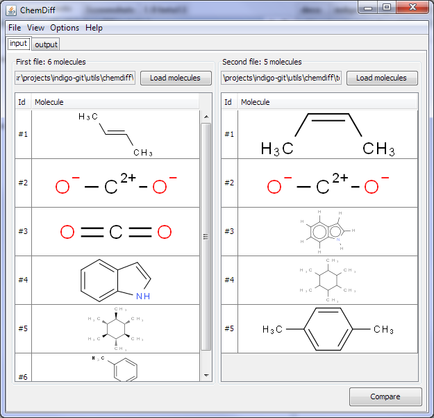 Files can contains large amount of molecules and ChemDiff was test on files with up to 1 million ones. 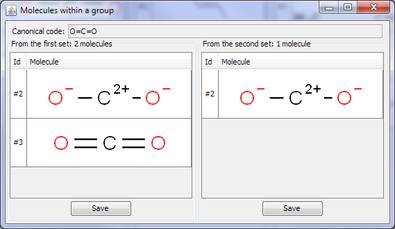 Compare 2 sets of molecules. 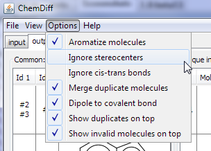 Find duplicates in a single set of molecules. 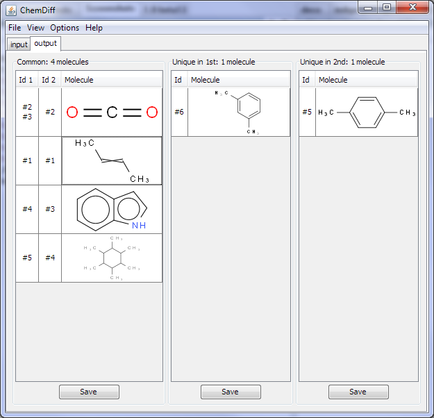 Test whether a specified molecule (or some set of molecules) belongs to another set of molecules. 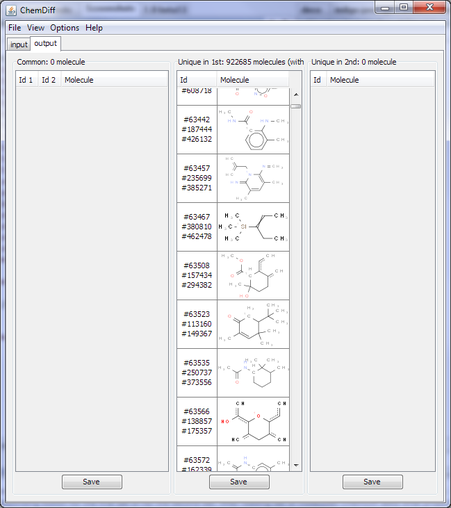 ChemDiff window contains two tabs: first tab is for input molecules, and second tab contains comparison result. 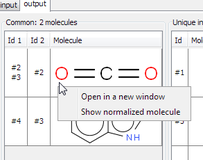 To load set of molecules you need to click corresponding button for the first set or for the second set. 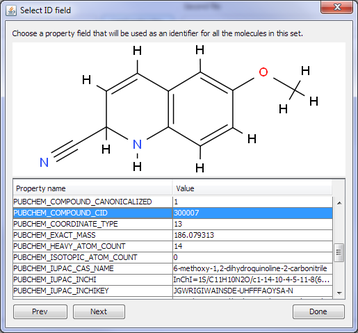 After loading set of molecules ChemDiff asks what property should be used as an identifier for the molecule. Example of such dialog is given below. 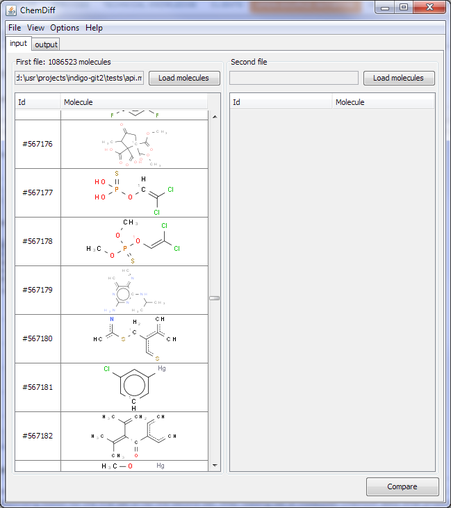 Table of possible properties contains name, serial number in the file, and all properties associated with this molecule. 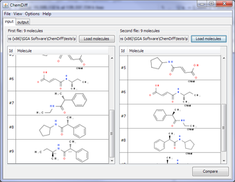 ChemDiff distribution includes a set of test files showing features of molecules comparation. 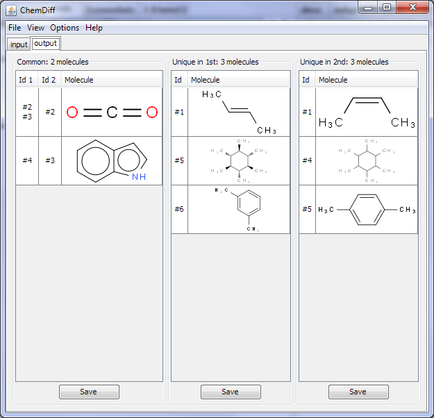 ChemDiff is written in Java and supports Linux and Windows operating systems, both 32-bit and 64-bit versions of each system. Mac OS X 10.5 and 10.6 are supported as well. ChemDiff depends on the Indigo library. The binaries of Indigo for all supported systems are included in the distribution. 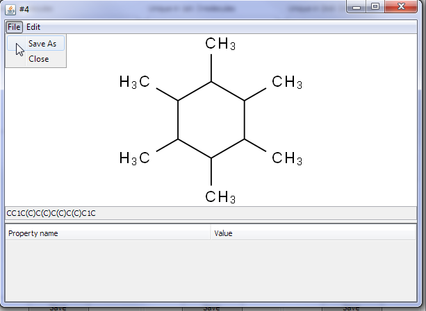 and then you will be able to run ChemDiff by typing chemdiff in the command line. Copyright © 2011 LifeSciences unit of EPAM Systems, Inc.
You should have received a copy of the GNU General Public License along with this program. If you did not not, please see http://www.gnu.org/licenses/.